Beautiful Italian Murano decanter set. This vintage set includes the decanter/pitcher and. 5 Hand Painted with 24K Gold stem glasses. Made in Italy and imported by Paul's Products. The hand-painted glasses measure 5 3/4" tall - a 3 1/4" bowl. With a 1 3/4 diameter. The decanter is 17 tall without the stopper with. A 3 1/2 diameter base. All pieces are in good condition- no chips or scratches that are visible- may be a little dusty from storage for so many years. If we can help you in any way please let us know. We are located in Somerville, N. 45 minutes SW of NYC and 1 hr. 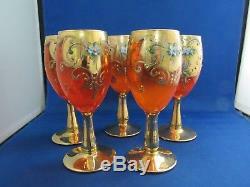 The item "Gorgeous Vintage Murano Glass Decanter and 24K Wine Glasses- HandPainted Italy" is in sale since Friday, November 24, 2017. This item is in the category "Pottery & Glass\Glass\Art Glass\Italian". The seller is "the-red-duchess" and is located in Bridgewater, New Jersey.